Discount JUGS Toss Machine - Free Shipping! 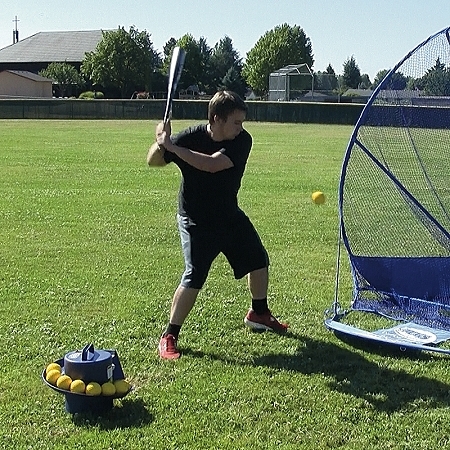 Used by more teams than any other baseball or softball drop toss machine, the JUGS Toss machine will take your hitting practice to a whole new level. No need to wait for someone to toss you balls, the JUGS Toss machine will lob ball after ball to you, right in the strike zone. Holding up to 14 baseballs or 10 softballs (11" or 12"), you may get tired of swinging before the machine stops tossing balls to you! 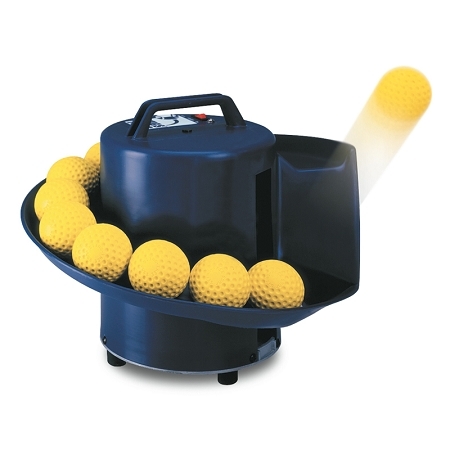 The JUGS Toss machine comes with a rechargeable battery that lasts up to 8 hours and, because it only weighs 13 pounds, you can take it to the field to warm up before hitting. It will pitch real balls, dimple balls and even lite balls, so you can use it practically anywhere - even in your garage. 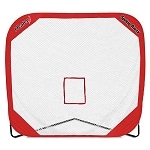 My son uses this a lot and it has really helped his hand-eye coordination. He loves it! Q: What's max speed of pitch? Is speed adjustable? A: There is no minimum or maximum speed to this machine. 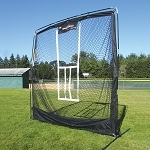 It is a soft toss machine that lobs a ball up into the air from a few feet away, much like a coach would toss a ball underhanded from a couple feet away. Check out the video on this page to see how the machine works. JUGS Toss Machines feature a 2 year manufacturer's warranty against damage caused through normal use. 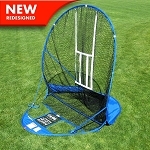 JUGS Sports will replace your toss machine, free of charge F.O.B. to its factory in Tualatin, Oregon; provided, however, that upon request, the Buyer shall return the allegedly defective machine to the Company s factory with transportation charges thereon prepaid. This warranty shall not be effective if the machine has been subject to misuse, negligence or accident, nor if the machine has been repaired or altered outside of our Tualatin factory in any respect which, in our judgment, affects its condition or operation. No matter where you order a JUGS Toss Machine from, NOBODY actually stocks them; they all ship directly from the manufacturer's warehouse located in Tualatin, Oregon. Therefore, the shipping time frame is exactly the same no matter what website you order from (we hope that it is this one!). JUGS Toss Machines typically take 2-4 business days to ship from the time you place your order. They ship via Federal Express (FedEx) Ground and could take anywhere from a day or two to a week to get to you AFTER being shipped, depending on your proximity to their warehouse. We will notify you of your tracking number the moment we receive it from the manufacturer's warehouse. Click here to download an easy to read, printable PDF of the JUGS Toss Machine Owner's Manual.